Prospective students who have been accepted to the School of Pharmacy for Fall 2018 attended Preview Day on Sunday, February 18, 2018. It was a beautiful February day and approximately 400 guests were in attendance (over 150 students and their parents). Visitors heard from Dean J. Douglas Bricker on what makes the profession of pharmacy a great career choice and what makes Duquesne unique among other pharmacy programs around the country. During the event, parents and prospective students participated in several informational sessions and student panel discussions. 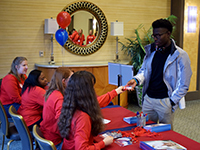 According to the Director of Recruitment, Mr. Jason Stack, Preview Day was an event that "created overall feelings of excitement, pride, and a sense of community - thanks to our volunteers. Faculty, staff and students made families feel welcomed as they showcased our academic and experiential programs and community involvement." Families were able to spend some time on campus and truly experienced what makes Duquesne special. There were a number of faculty and student pharmacists who served as tour guides. The more than 180 student pharmacists who participated in Preview Day shared their experiences at Duquesne with prospective students and their parents. According to the parent and student survey after the event, having students and faculty present at the event was an added benefit to understanding why they might choose Duquesne to study pharmacy. We look forward to seeing them matriculate into the program this Fall.